Here’s your chance to be part of a great new project dedicated to celebrating International Women’s Day, the annual global event that celebrates the social, economic, cultural and political achievements of women. 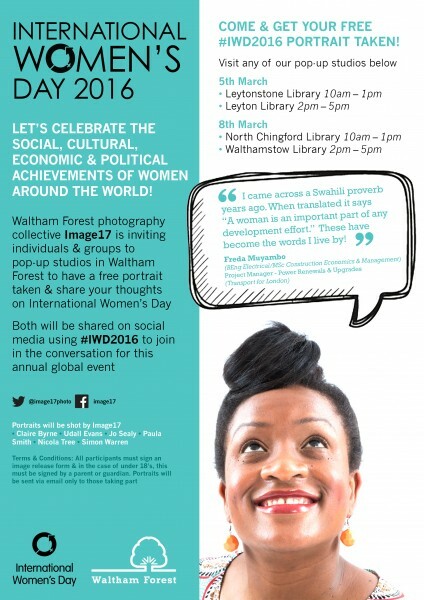 Waltham Forest photography collective Image17 is inviting individuals and groups from all over the borough to join us on 5th and 8th March at one of 4 popup photo studios in Waltham Forest. You’ll have your (free) portrait taken and be asked to share your thoughts about International Women’s Day. Your image and thoughts will then be shared on social media using the hashtags #IWD2016 #WFIWD for the world to see! The project has been commissioned by Waltham Forest Council. Turn up – could be just you, with a friend, couples, partners, grandparents, teams, groups, anyone! The Image17 photographers taking part in this project are: Claire Byrne, Udall Evans, Jo Sealy, Paula Smith, Nicola Tree and Simon Warren. Each photographer will bring their own individual style to the portrait sessions, giving the social media feed a unique and creative flavour. All participants must sign an image release form and in the case of Under 18’s, this must be signed by a parent or guardian. Portraits will be sent via email only to those taking part.